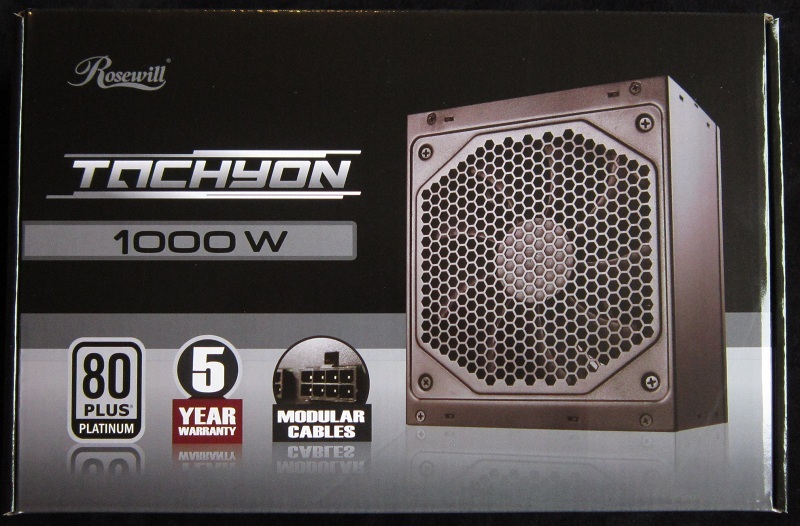 Rosewill has decided to get into the High Wattage High Efficiency power supply game, their TACHYON series runs from 550 W up through 1000 W. Naturally enough, I went for the 1000 W flavor. 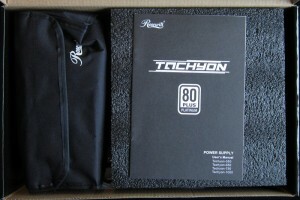 It boasts 80+ Platinum efficiency, modular cables, as well as general awesomeness. As a side note, a “Tachyon” is a theoretical particle that always moves faster than light. 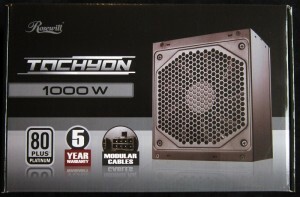 Unless this PSU is playing serious games with time, it isn’t that sort of tachyon. It’s a bit big for a single particle anyway. I’m taking a different path through this section this time. It’s easier for me, easier for the editors, and also decreases the fluff content somewhat. Rather than copying over (or writing up) what Rosewill has on their product page or on the box, I’m just taking pictures of the box. It’s easier for everybody! I’ll still blather on about it for a while though, don’t worry. 80+ Platinum we all know and love by this point. Same for modular cables and APFC. EUP translates to “Off means off”, which is nice. Not surprisingly this 1 kW unit can run multiple GPUs! Who would have thought? The fan is supposed to be silent, I seriously doubt that it is. Silence is an absolute, if it makes noise it is not silent. Auto speed control is taken for granted now. All high quality Japanese caps is nice, if true. I’ll check! The protections list looks nice too, notably absent is Over Temperature Protection. I’ll check the Short Circuit Protection in the testing phase, that’s the only one that I can check without overloading the unit, and I don’t like to overload them. Five year warranty is nice too, not record setting, but solid. What the One to One Replacement is, I don’t know. For connectors we have another chart! The red box is today’s unit. The 3.3 V and 5 V is a bit low, usually we get 25 A and 150 W total. It won’t be an issue. 5 VSB is a bit low for a 1 kW unit in my opinion, but unless you’re trying to charge multiple iPads with the computer turned off, I wouldn’t worry about it. Not surprisingly you can pull the whole 1 kW (or close enough) from the 12 V rail. I’ve yet to see a Platinum unit that wasn’t DC-DC, I’m not sure it’s even possible really. 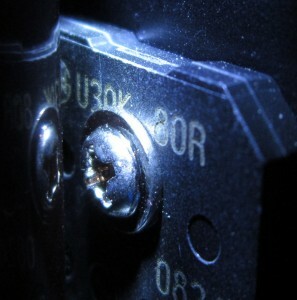 Note the single rail, this is often advertised as being “efficient” or “easy”, in reality it’s simply cheap. Multiple rails costs more money, but is safer. When properly designed you get more safety without any extra issues or complication. See, wasn’t that an easy specs/features section? Now we can look at pictures! Bottom of The Box. Recognize the Charts? 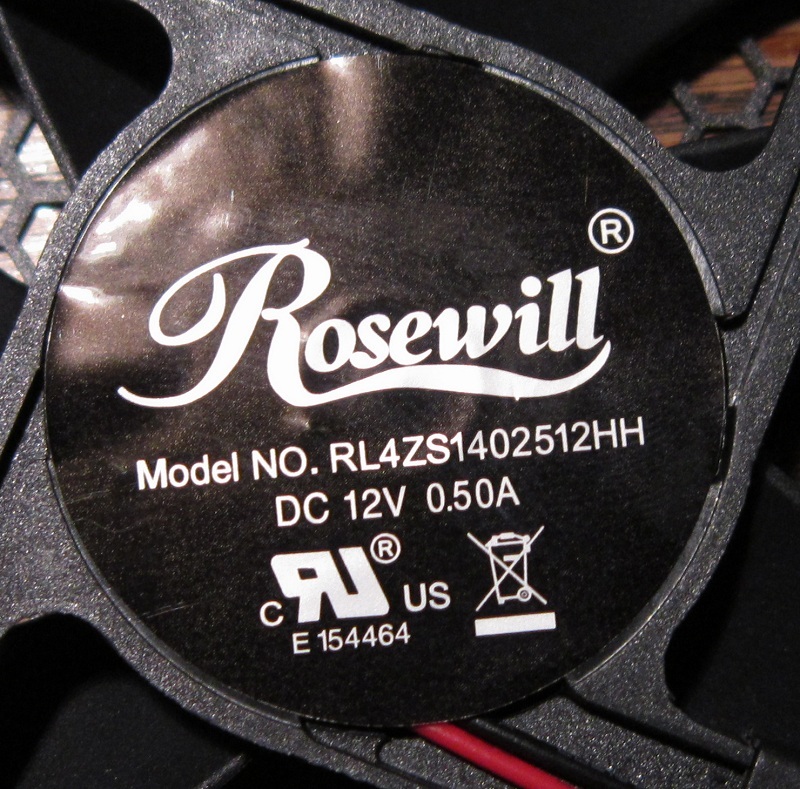 Much to my delight, Rosewill spent the extra money for a full foam surround on this unit. That makes me happy. The manual is somewhat informative, but not enough to make a difference between being able to install the unit and not being able to install the unit. 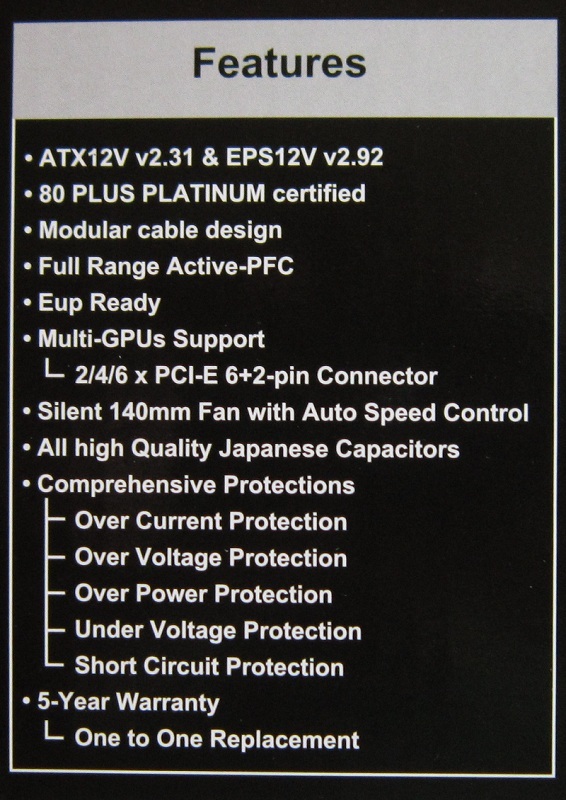 That about does it for this section, next we’ll look at the PSU itself. This should be somewhat more interesting than the box. This is a very basic looking unit. 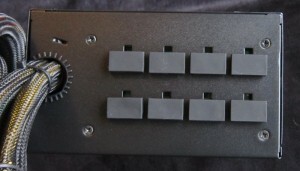 From the matte black side panels through the unlabeled modular connectors to the stamped fan grill, the obvious design flavor here is cost cutting. I’m fine with that. Actually I’m happy to see that! It means there’s more money to go into the guts. In theory, anyway. On the modular connectors: They’re all electrically identical, any cable can be plugged into any connector. This is ideal in my opinion. Also of note, that rear panel looks nearly identical to the Super Flower Golden King based NZXT HALE90 units. 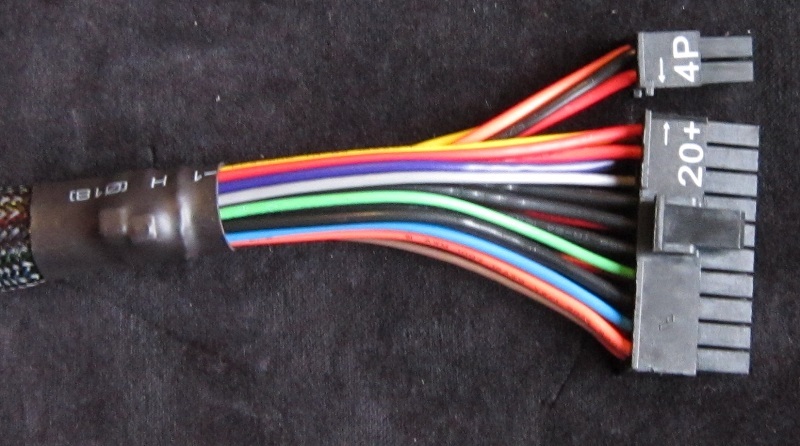 Included are four PCIe cables each with a 6+2P connector, two SATA cables each with four connectors, one Molex cable with four Molex connectors and one FDD connector, and one combo cable with two Molex connectors and two SATA connectors. I really like these combo cables. The power cable is a nice juicy thing, this is good. We also get a few cable ties and a sack of screws. 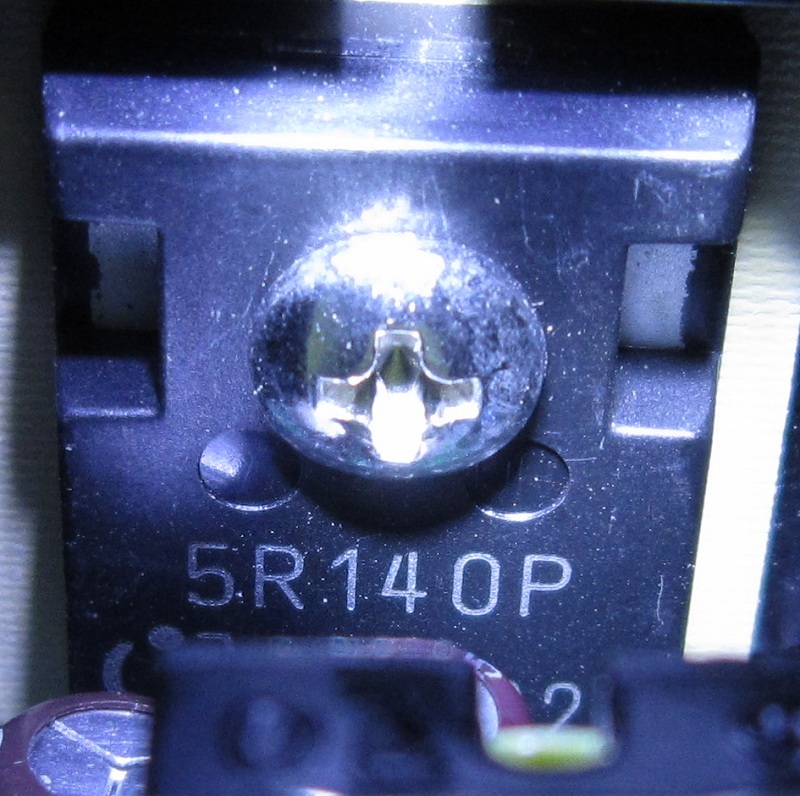 We get four black normal screws and four black thumbscrews, this is very nice. On to testing! A decent load test of a PSU requires a decent load. 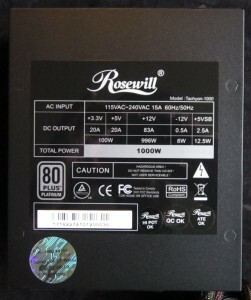 Contrary to what some may believe, that means you need a known load that can fully stress the PSU. Computer hardware does not cut it. Worse, if the PSU fails during testing it might take out the computer hardware anyway. Commercial load testers cost a lot of money. I do not have a lot of money, so I built my own with juicy power resistors and a Toyota cylinder head. It works great. I’ll be using it to load this thing down fairly severely and will check voltages and ripple (more on that later) at various points. The down side to my tester is that the loads it can put on PSUs are fairly coarse, they go in increments of 48 W for 12 V, 50 W for 5 V and 22 W for 3.3V. Those wattages assume the PSU is putting out exactly the official rail voltage, a PSU putting out 12.24 V rather than 12 V will be at 49.9 W per step rather than 48 W. I file that under the “tough beans” category as I figure if a percent or two of load makes that much of a difference, the PSU manufacturer should have hit the voltage regulation more squarely. It does make calculating efficiency difficult at best. However, given that the input power is read via a Kill-a-Watt, the efficiency numbers are dubious to begin with. Kill-a-Watts are not known for extreme accuracy on things with automatic power factor correction. For this reason, I am not listing the efficiency. The ATX spec says that voltage regulation must be within 5% of the rail’s official designation, regardless of load. 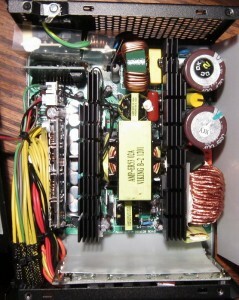 It doesn’t actually mention that the PSU shouldn’t explode, though I expect they figured it was implied. Exploding is a failure in my book regardless. 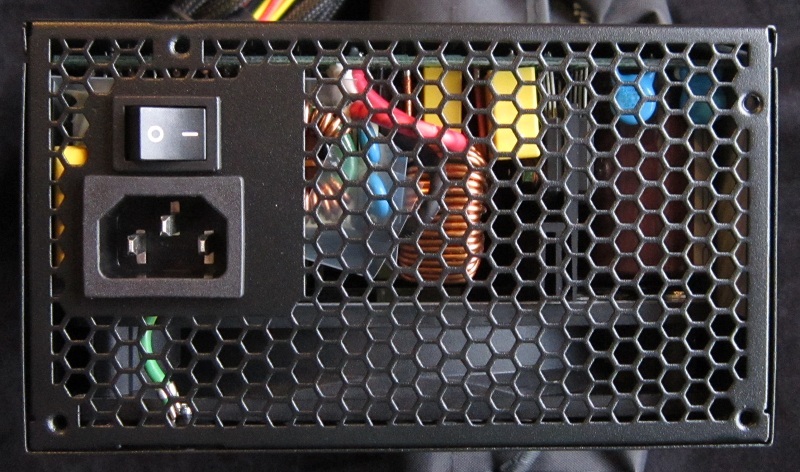 It is also worth knowing that I will be testing this PSU at both outdoor ambient temperatures (typically between 10 °C and 20 °C here this time of year) as well as in the Enclosure of Unreasonable Warmth. 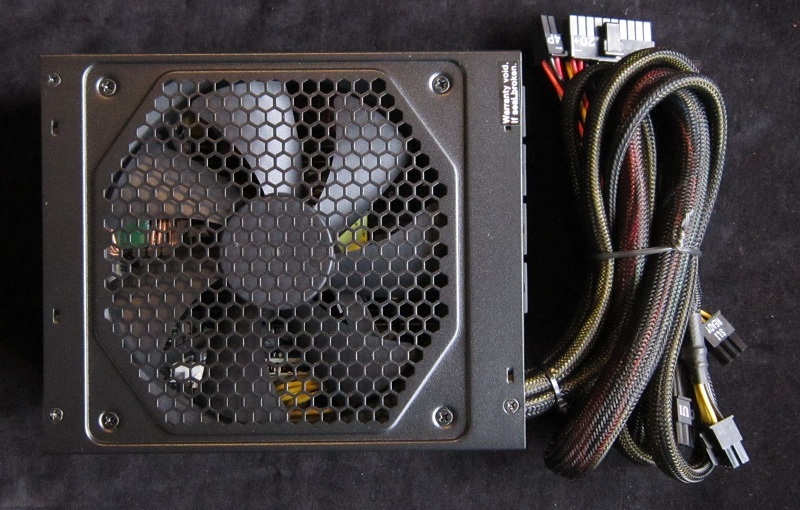 TEUW is a precision engineered enclosure that I use to route the exhaust air from the PSU right back into the intake fan, it is adjustable to hold the intake air temperature at (almost) any level I want it. This way I can test the PSU’s response to hot conditions as well as cold conditions. For the hot testing I will be running the intake temp as close to the unit’s maximum rated temperature as possible. TEUW, in case you’re curious, is a cardboard box. First thing to talk about is the fan. The temperatures marked with * indicate that the fan was not running at that point. It took full load to convince the fan to run! When it did, it was slowly and very quietly. I could not hear it at all if my head was more than ~15″ away from the fan. In TEUW, the fan stayed quiet until 35 °C intake temperatures were reached, at which point it switched directly to full blast mode. Full blast mode is on the quieter end for TEUW, but definitely not silent. Regulation on the 12 V rail came to 0.16%, which is fantastic. The 5 V rail came in at 1.7%, which is good. The 3.3 V rail came in at 1.5%, which is also good. The grand total is regulation of 1.14%, just over the magical 1% number, but still very good. The Kill-A-Watts results point to this unit being quite efficient, if we’re believing the Kill-A-Watt today. I couldn’t get the intake temperature over 44 °C, hence my stopping there rather than going all the way to 50 °C. 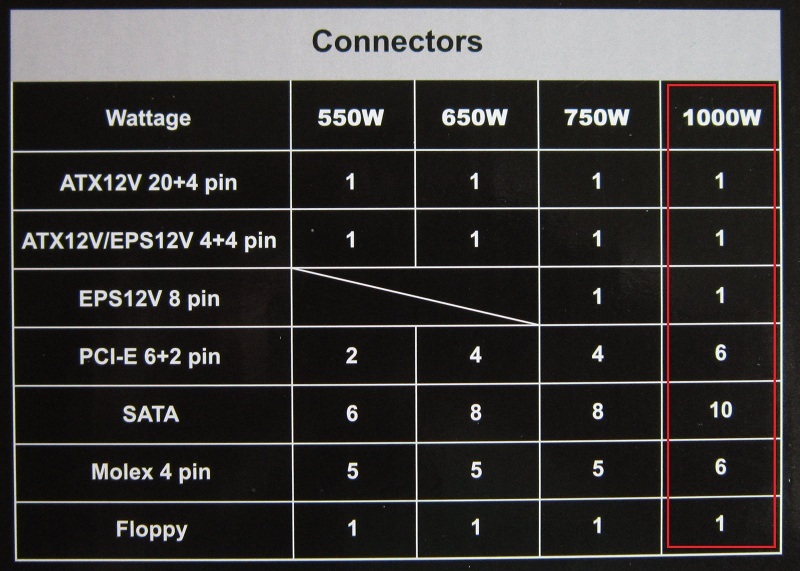 Ripple is fluctuation of the PSU’s output voltage caused by a variety of factors. 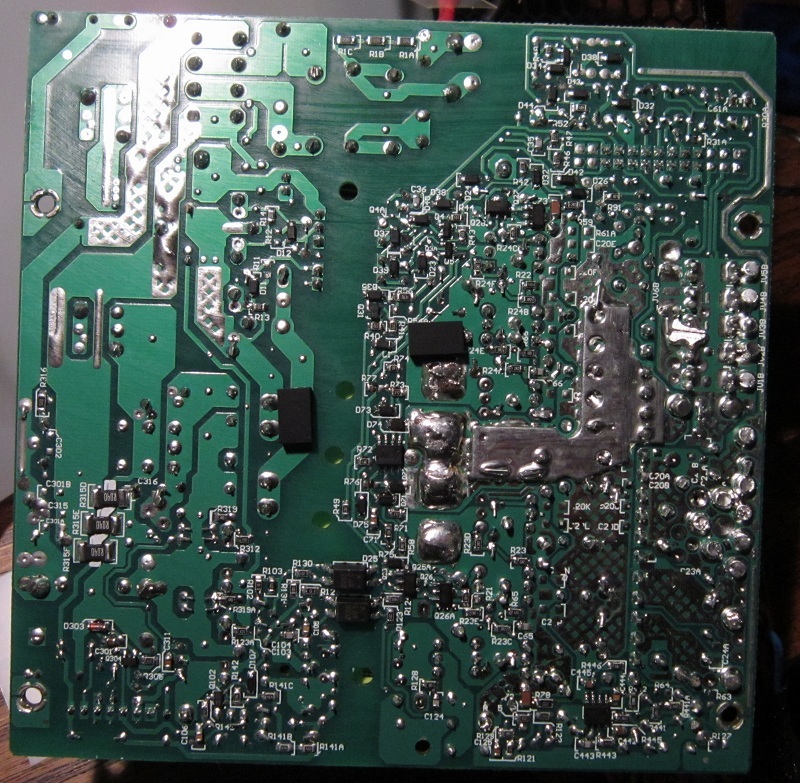 It is pretty much impossible to have zero ripple in a SMPS computer power supply because of how a SMPS works, so the question is how much ripple is there? In the regulation testing phase we found out how the PSU does at keeping the average voltage at a set level, now we’re going to see what that voltage is doing on really short time frames. The ATX spec says that the 12 V rail cannot have more than 120 mV peak to peak ripple, the 5 V and 3.3 V rails need to stay under 50 mV. If that isn’t complicated enough for you, there are three forms of ripple to keep track of as well. 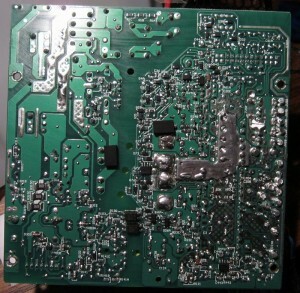 Long-term ripple from the PSU’s controller adjusting the output voltage and over/undershooting, correcting, overshooting, etc. 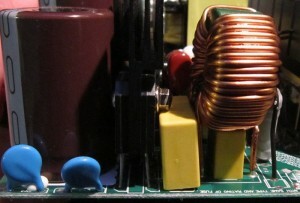 Medium-term ripple from the voltage controller charging and discharging the inductor(s) and capacitor(s) that make up the VRM, and very short-term ripple caused by the switching itself. The first and second forms are the most important, if they are out of spec it can cause instability at best or damage in extreme situations. The very short-term (I call it transient ripple) flavor is less crucial, excessive amounts can still cause issues though it takes more of it to do so. The ATX spec does not differentiate, as far as the spec goes 121 mV of transient ripple is just as much of a failure as 121 mV of medium or long term ripple. I test ripple in a few difference ways, first I test it during the cold load testing. It is tested at zero load and maximum load first. During the hot load testing I test the ripple at maximum load again. I have recently started testing ripple at fairly random loads with the unit still hot, it’s a bit unorthodox (a bit? maybe a lot) but has found issues in the past that did not show up with other test methods. We’ll start with the zero load ripple. Scope is set to 5 ms / 10 mV for all three shots. This looks very good. How about some load? How about FULL load? Same scope settings here. Still looking good. 12 V is just over 30% of the max allowed, 5 V and 3.3 V are a bit over 50%. Now to add some heat! For the hot results the scope settings were changed to 5 microseconds / 10 mV. This allowed me to capture the very brief transients caused by the 5 V and 3.3 V MOSFETs switching. The 12 V rail didn’t really care about the heat. The heat, plus the higher speed scope settings, captured some transients on the 5 V and 3.3 V line that bumped them up a bit ripple wise. Even so, they’re well within spec. No issues here! The last thing I did was short the outputs with the PCB end of a dead PSU’s cable, I tried a few different times and despite making a solid enough connection to get a sustained violet arc, the unit never shut down. 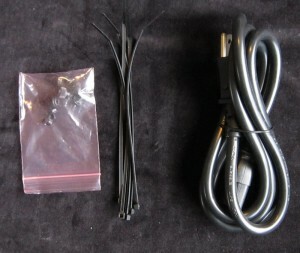 Below is a picture of the test implement. This is exactly why multiple rails are better for high power units. A multiple rail unit with ~35 A OCP on the rails would have shut down, I know because I’ve done this same test on one. If you never have a short circuit this won’t be an issue. If you do have a short circuit it better be able to put the unit into OPP shutdown. Also, please don’t test this like I did. It’s not a good idea. Disclaimer: Power supplies can have dangerous voltages inside them even after being unplugged, DO NOT OPEN POWER SUPPLIES. It’s just not a good idea. Opening a power supply and poking around inside could very well kill you. Don’t try this at home. Don’t try this at work. Just don’t do it. I mean it, too. This platform is a fairly common one for high wattage platinum units. Super Flower really knocked out a good one here, it’s shown up in quite a few different units. 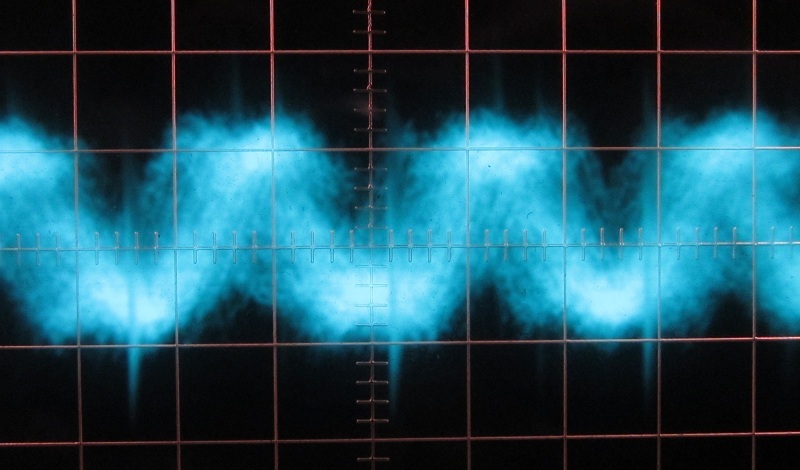 We’ll step through this thing next, starting with the transient filter. 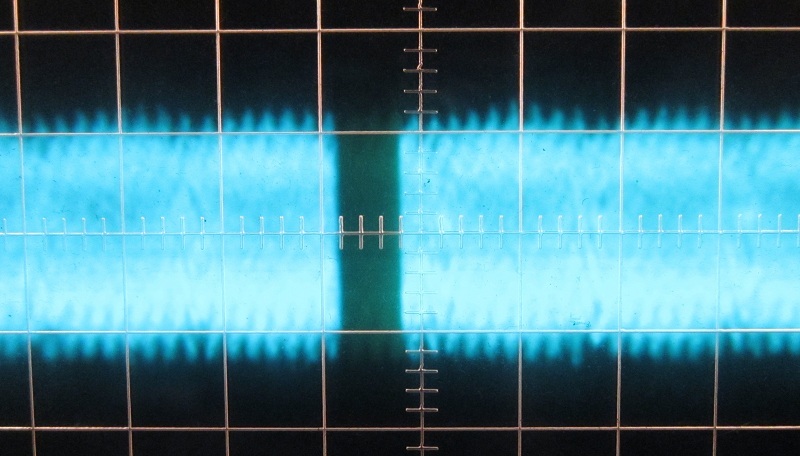 Today’s transient filter has three X caps, four Y caps, and two inductors. There’s a fuse too, but nothing for surge suppression. Be sure to use a surge protector. Next we have the APFC bits! First up we have the rectifiers, a pair of U30KB80R units rated at 30 A and 800 V. Following that we have a 1653A APFC brain (with wrap-around EMI shielding) running a pair of 5R140P MOSFETs, about which I can find nothing specs wise. The diodes are CREE C3D10060 units rated at 600 V and 10 A. We also find a thermistor here, plus a relay to short it out once the unit is running. This gains a bit of efficiency. 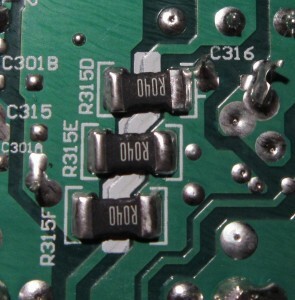 Two Nippon Chemi-Con capacitors finish off the APFC section. 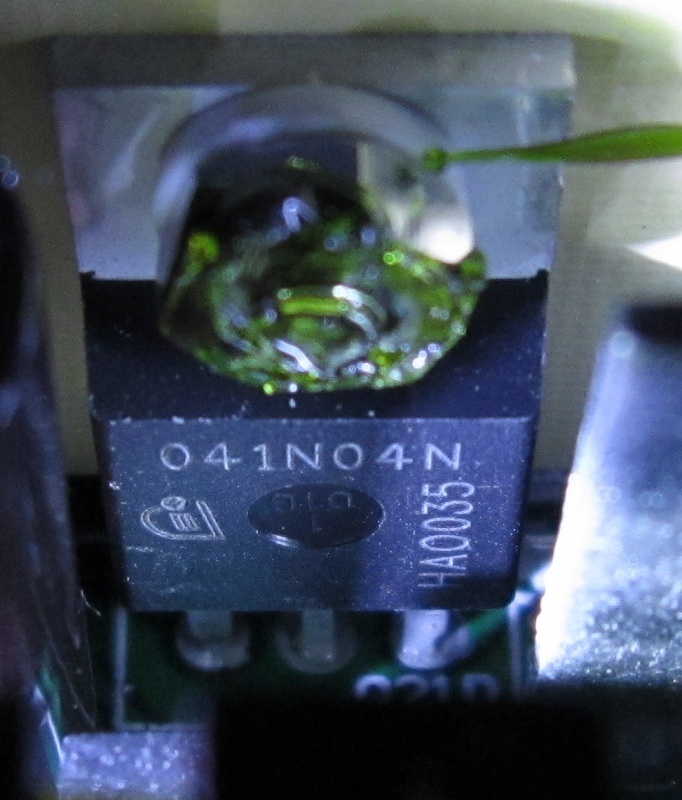 Controlling the PWM MOSFETs, and on protections duty is a proprietary Super Flower IC, with no available datasheet. 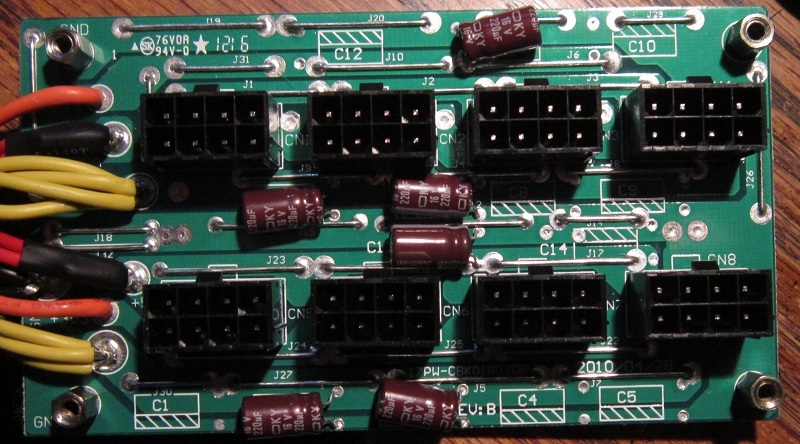 It controls another two 5R140P MOSFETs (about which I still can find no info). 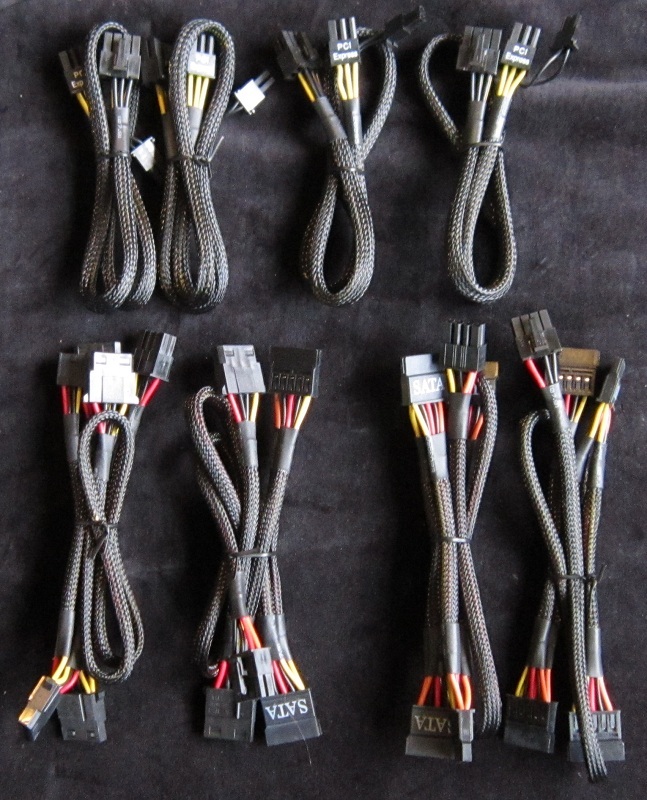 On rectification duties, we have ten 041N04N MOSFETs, each rated at 40 V and 80 A. That’s 800 amps of rectification, also known as “wild overkill”. I like it! 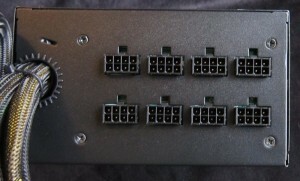 The DC-DC boards have four 060N03L MOSFETs (60 V, 120 A) for each rail. They hide behind a combination heatsink / faraday cage. The power that doesn’t head out the hard wired cables goes to the modular output PCB, seen below. Modular PCB Mounting Nuts are Threadlock Glopped. 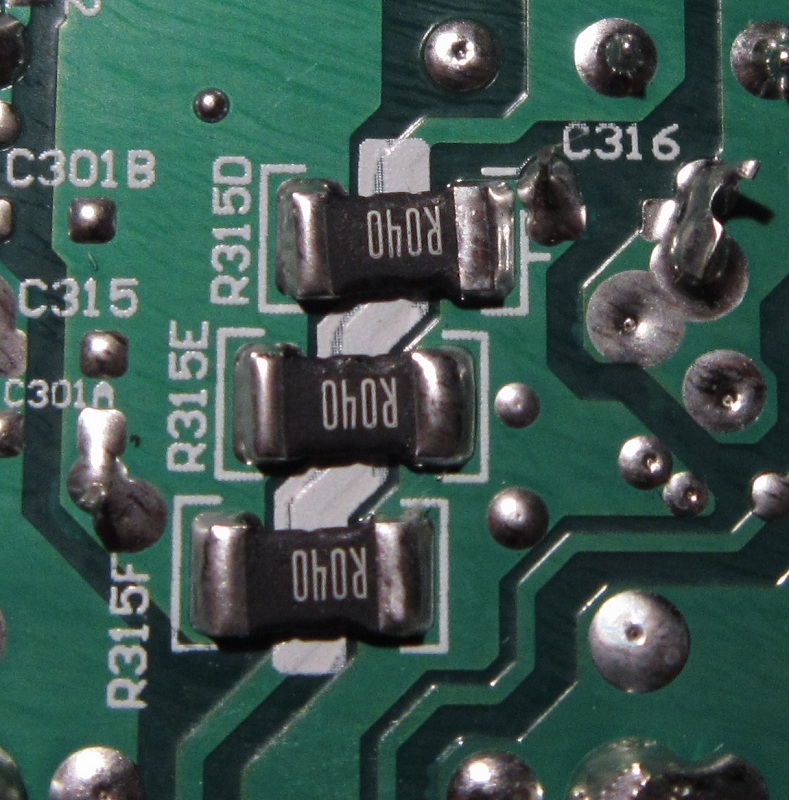 Scattered across the modular board are some Nippon Chemi-con electrolytic capacitors. 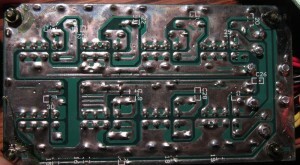 On the main PCB are more of the same, plus a rank of polymer “solid” capacitors. Every cap that I can find / ID is Nippon Chemi-Con. This is good. 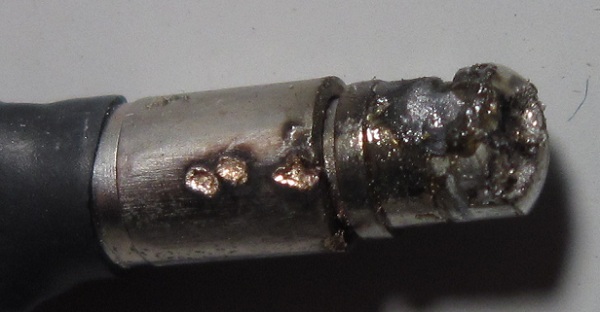 Soldering is decent, a bit messy in spots, but not hugely. 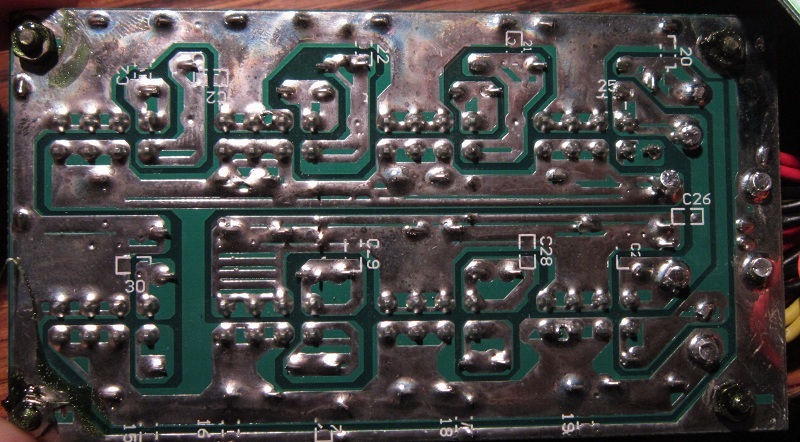 No real issues in the soldering, it’d be nice if it were cleaner though. Notably absent is a UL number. The case also lacks a UL number. I’m not surprised that the PCB lacks one as I have yet to see one on a Super Flower board, but usually the case will have one. This isn’t an issue, it’s just weird. All told the internals look just as good as the performance did! 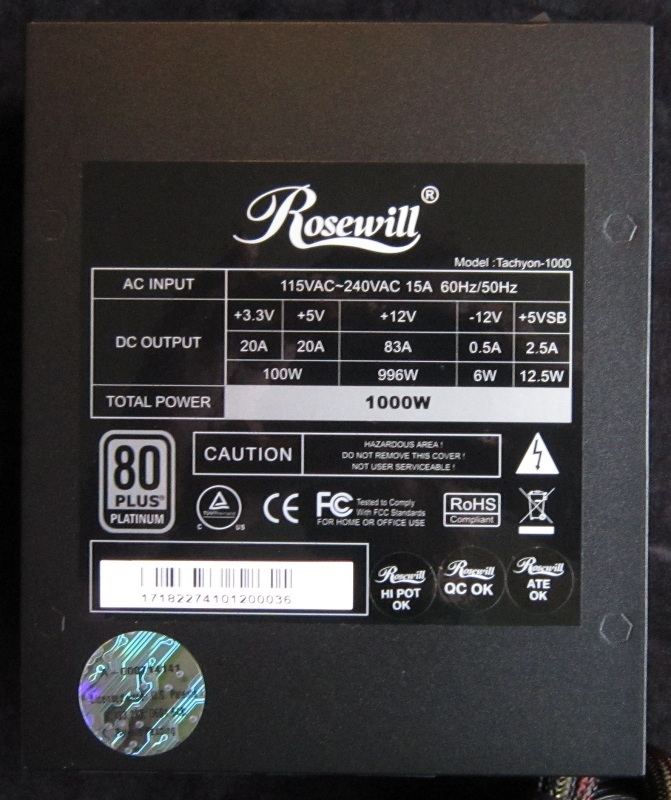 I have to admit that I was skeptical when I first got this unit, the name Rosewill hasn’t gone very far to impress me in the past. Having tested this unit I am now looking at Rosewill in a new light! 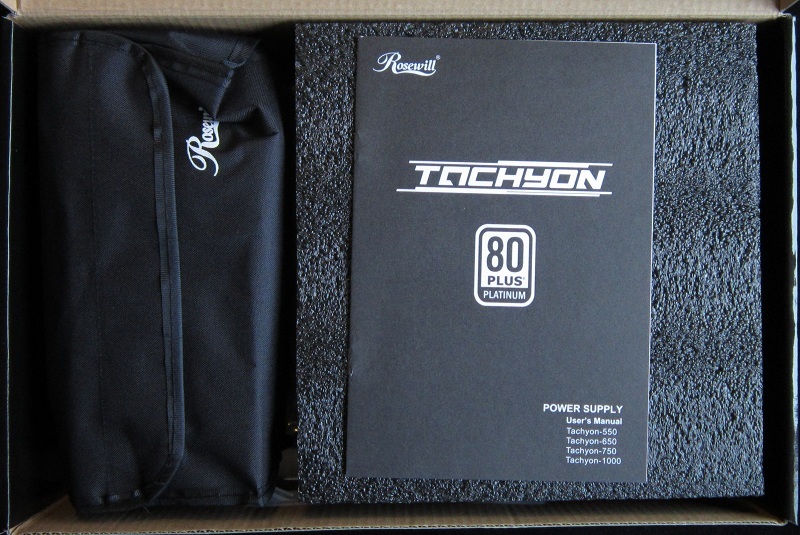 The regulation is excellent, the 12 V regulation is straight up epic. 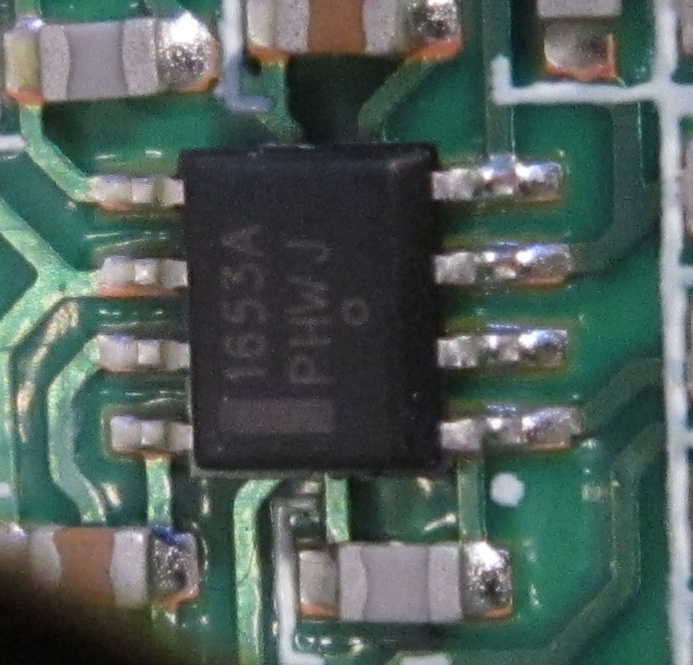 It’s unfortunate that the 5 V and 3.3 V rails couldn’t do a better job (am I really complaining about <2% regulation?) and get the unit below the 1% mark. Still, it’s very very good. Ripple control on the 12 V rail is quite good as well. 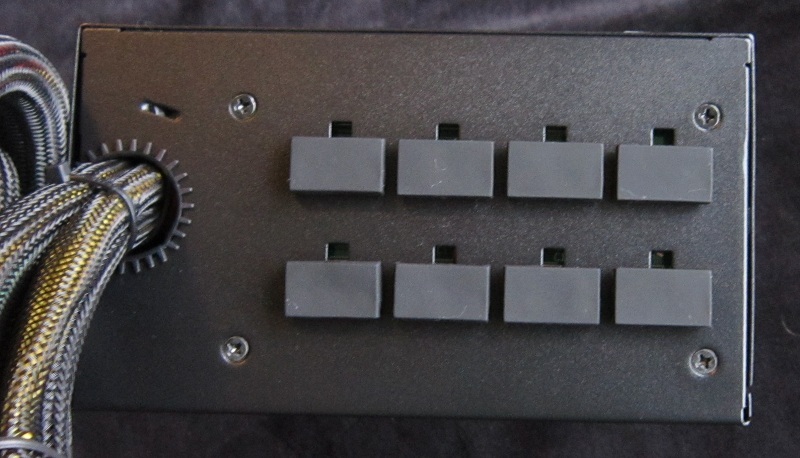 The 5 V and 3.3 V rails are acceptable bordering on good, not really anything special either way when it comes to ripple control. The fan really was silent up until full load, largely because it wasn’t turning! After that it was extremely quiet, up until ~35 °C intake air temperatures at which point it sped up quite a bit and got louder. Still not bad at all, but definitely not silent. The cable selection is good. 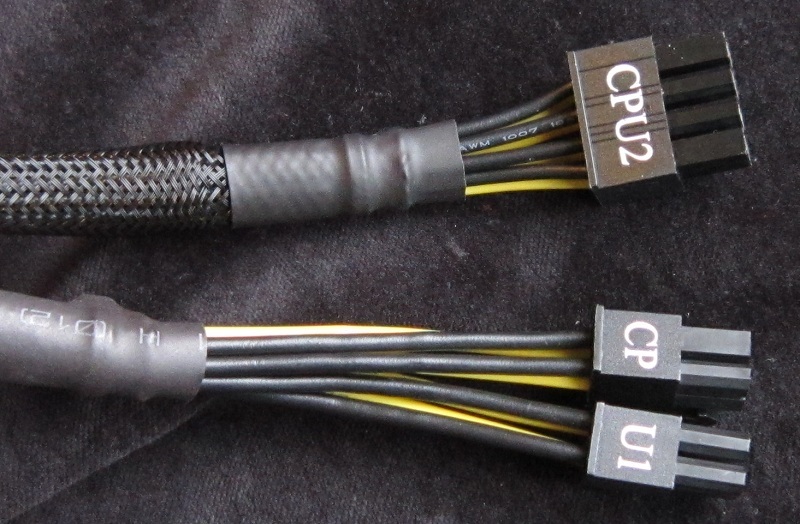 I find the two hardwired CPU power cables annoying, but it’s not rare nor is it a staggering issue. We do get plenty of PCIe cables. 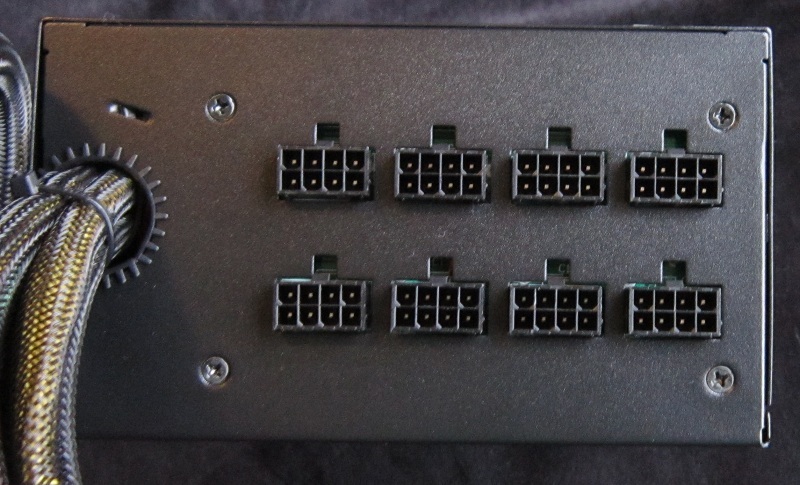 You cannot plug the modular cables in incorrectly. I like this a lot. The lack of functional SCP is annoying, if not surprising. Build quality is good, I’d prefer that there was a MOV / TVS Diode in there, and neater soldering certainly wouldn’t be a bad thing. It’s good as is though, really. Price wise there is only one 1 kW platinum unit available for less money on Newegg. That is an Azza unit that is based on the same platform. Everything else costs more. This unit is $220, not bad for 1 kW of platinum! The Azza unit is $10 cheaper, but may or may not have the same Japanese capacitors. There are a few units in the $230 bracket as well. I’ll call the price of this unit “Good”, because it is. Happy to run in >40 °C ambient. Totally silent in low/mid load ranges. Quiet even at full load, given a <35 °C ambient. Fan could do with something between super-slow and full speed. 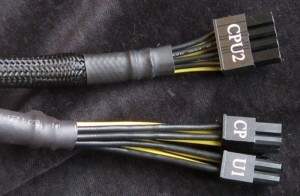 Two hardwired CPU power cables is annoying. No MOV / TVS Diode. Not an issue if you have a surge protector. No SCP that I could find. All told this is a very good unit for a good price. I approve of it! 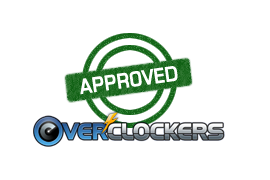 Click the “Approved” to learn exactly what it means. Was waiting for these Tachyon units to land Finland, ended up going with the Super Flower Golden King instead. Looks like this would've been a good choice too! 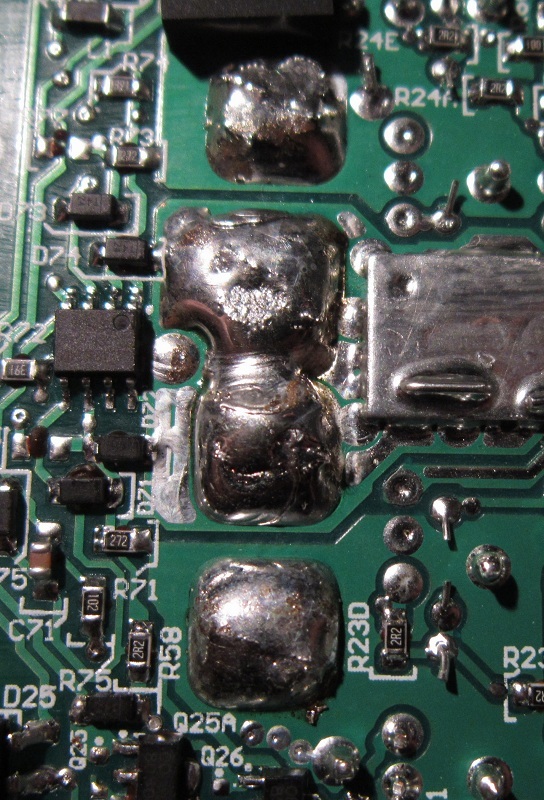 nice review, I have had an LED that's leads where not completely covered slip out of a reservoir and trip the protection (*edit* because the lead hit the 5.25" drive cage) Not sure what would have happened if it did not (melted LED lead?) but that is a bit scary to see it did not trip. How does great ripple affect the computer compared to good or below average ripple? 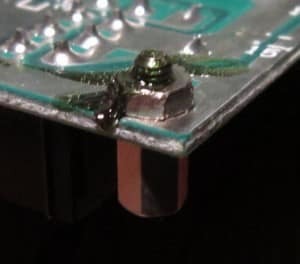 I'm not completely sure is it because of small ripple, transient spikes or smaller "cross-talk" between the different rails, but I've found my Golden King which has very little ripple to not have the buzzing/whirring/chirping on sensitive speakers, depending on CPU and GPU loads. 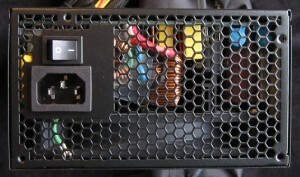 Modern motherboards have lots of multi phase power filtering so I don't think any of the PSUs which clear the most current ATX revision should have issues even if the ripple was relatively large, but still within specs, but analog sound circuitry seems to benefit from a high-quality PSU, the ancient one I used for a week was NOISY on the speakers. 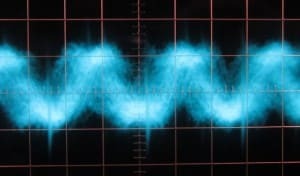 That is interesting I could understand choke whine being less of an issue on a better PSU wether it was because of the ripple or not and it may very well have been a factor to your audio phenomena but there are other unexplanables that added to your issue with your speakers. I was wondering though if the lower ripple effected overclock stability or stability in general and again comparing good to great not poor or out of spec to good or great. Realistically speaking, it depends on the ripple. 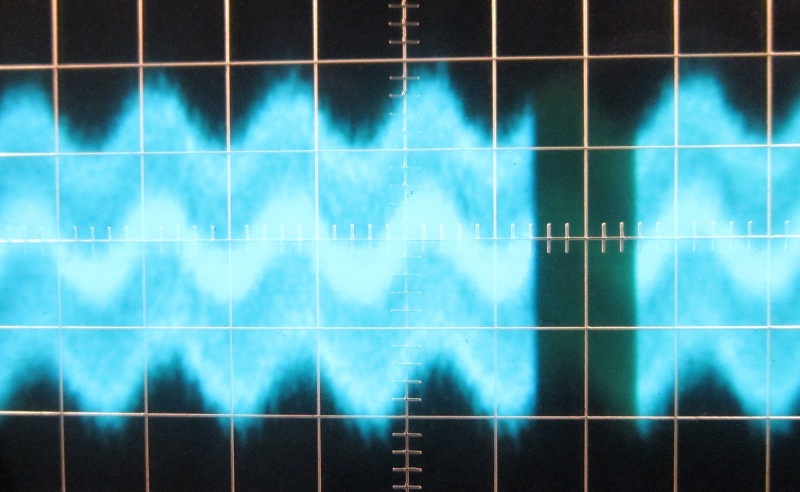 The long waveform ripple that comes from the feedback loop in the regulator is almost always audio frequency, having that flavor nice and low will reduce the chances of inductor whine and possibly help with stability on the absolute ragged edge OCing. More on that in a bit. Note that you can see the medium and short duration ripple imposed on the long duration. 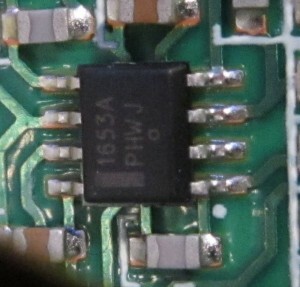 Medium duration ripple is an artifact from switching the MOSFETs on and off, when they're switched on the voltage rises (way above 12v/5v/3v3, if you leave them on too long), when they're switched off the voltage drops. All SMPS PSUs have some of this ripple, it's unavoidable. 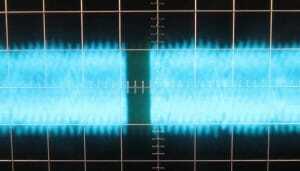 Last is short duration ripple, also known as transients. These are extremely short spikes that happen when a MOSFET switches. Typical duration is 500ns or less. They can cause issues with an extreme OC, but are unlikely to. Massive transients are a potential hazard to hardware that doesn't have proper filtering to remove them, as they can pass straight through VRM sections fairly unchanged. Your HDD motor doesn't care if there is a 400ns spike of 500mV. Your CPU would appreciate it less, though. Short duration ripple doesn't have to originate in the rail it comes out in, either. 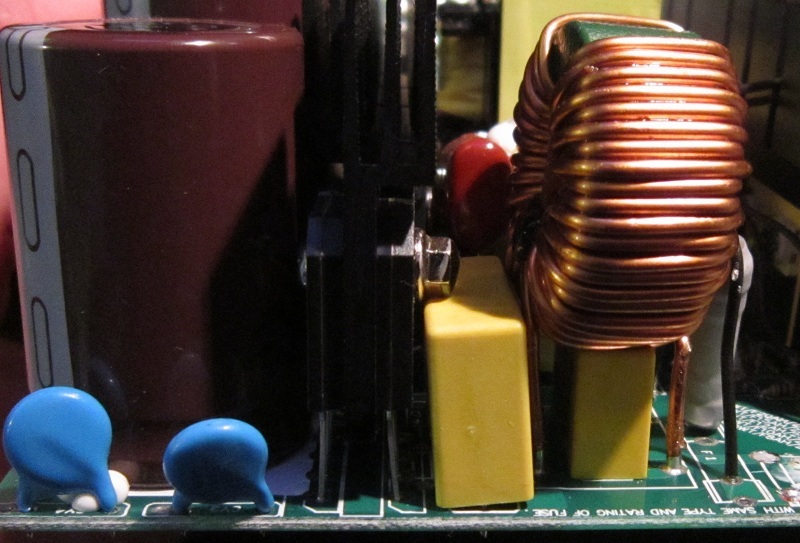 As the MOSFETs charge and discharge the inductors (APFC) and transformers (5VSB, 12V, 5V, 3V3) there is an external magnetic field that changes violantly, that's the only reason this stuff works in the first place. However, changing magnetic fields induce current in conductive materials they are around. Welcome to EMI! The field of the main transformer switching for 1500w is quite intense, while the electrical output goes through proper filtering to smooth it out the field can induce transients in the modular PCB or in the output wires. 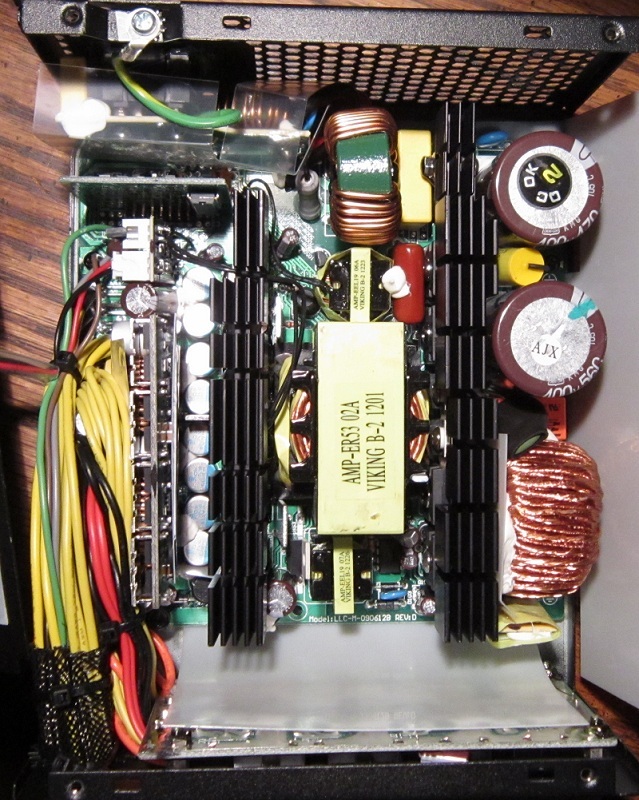 The PSU case acts as a faraday cage to keep this EMI hell internal, and good PSUs are set up so that the wires and PCB traces are the wrong length to receive the EMI signal strongly (just like an antenna, the wrong length means terrible reception). 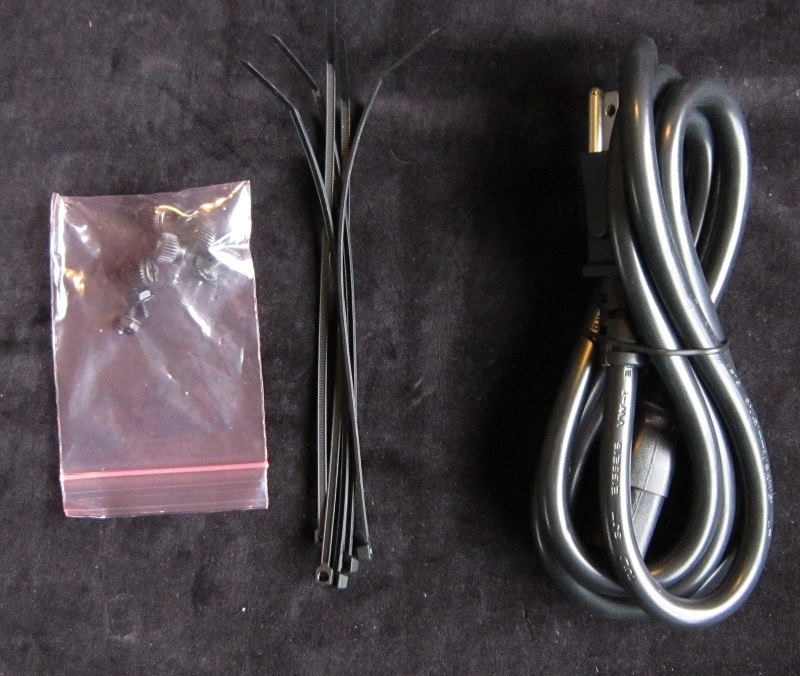 Normal 24/7 OCs can take a lot more ripple than extreme OCs can, and even at the extreme level the difference between 20mV on 12V and 80mV on 12V is going to be extremely difficult to find. Audio stuff generally has very good input filtering, but if that is overpowered by a messy PSU you'll know it. 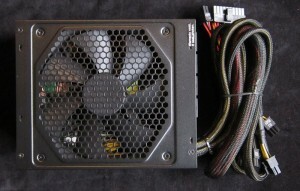 With good input filtering (be it on a card or onboard) any PSU within the ATX spec should be fine in general. The last units I had with wild, but not especially dangerous, ripple were the InWin Glacier units. They had transients in the 190-200mV area on all three rails at full load. I sold both of them (with large disclaimers and warnings of course, and a rather low price) and both as still in service with no issues at all as far as I know. 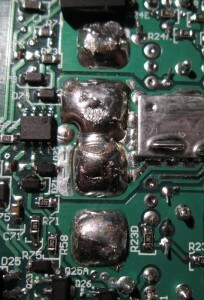 As you can see in the ripple pictures, the MOSFETs are creating nice spikes when they switch. Internal EMI or poor filtering? Hard to say. I've had other units where pushing the cable pack into the PSU 1/8" or pulling it out 1/8" could raise or lower transients by >100mV. All inductors will ring at some frequency(s). 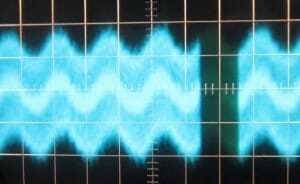 They also ring magnetically at some frequencies, sometimes the same, other times totally different. Whether we want them ringing magnetically really depends on what we're doing. Unfortunately we have a lot of harmonics to worry about. Example: An inductor (anything, really) switched at 100kHz will have potential to ring (both ways) at 100kHz, 50kHz, 25kHz, 12.5kHz, 6.25kHz, 3.125kHz, etc. 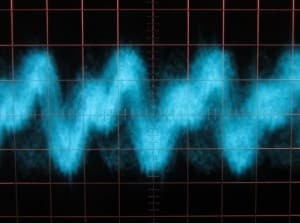 Each harmonic is weaker than the one before, so a good (for audible noise, anyway) is one that does all its ringing at 100kHz and 50kHz, and doesn't have enough energy left over at 25kHz and 12.5kHz to overpower the physical inertial of the thing and the silicone glue good manufacturers put on it. A lot more detail could be gone into here, but I have reviews to write and cookies to make, so I'm going to cut it off here. If it's within ATX spec it is very unlikely to cause any issues with anything. That's the point of the ATX spec. Devices with lousy input filtering or extremely sensitive devices that don't have staggeringly overkill input filters may be different. 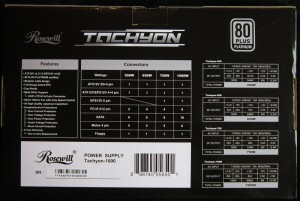 Thanks for the post, was looking for some good insightful knowledge on how can a PSU affect sound if the circuitry has less than optimal power supply rejection ratio, really informative stuff! awww you just got into the good stuff too! Thank you for the explanations, both in the main piece and in your long response. I think it is a clear explanation of issues in PSU 102, and needs to be posted in a citable place somewhere. Great job.